4 path blocks placed in a square on some grass. 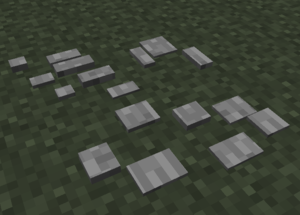 The Path block is a block added by the OpenBlocks mod. It is an aesthetic block used to create an illusion of a sparsely paved path. The block has a small bounding box, similar to that of a ladder. The path block has several shapes. When it's placed in the world, a random shape is selected. This page was last modified on 19 May 2016, at 19:25.